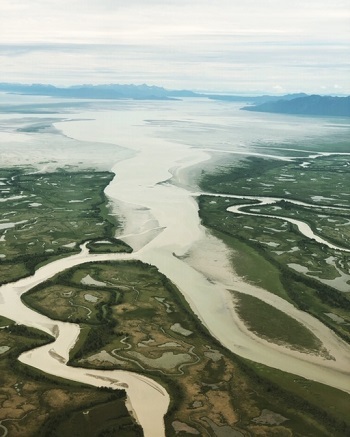 Traveling along a line… 60 North, an imaginery line that connects people, knitters, fisherfolk, peace, and my heart, today we visit the most special of places, Cordova, Alaska, a mere 4000 miles from Shetland. 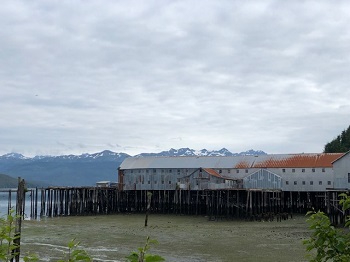 Here, you’ll find a tiny, little fishing village tucked away in the wild of Alaska remotely located on the Copper River Delta in Prince William Sound. While Amazon has most certainly provided the people of Cordova with access to more “goods,” one can’t help but notice that the choices for groceries, eating out, or clothing options are limited. That life is just a wee bit simpler… in a really good way. So with that need to acquire “stuff” set aside, one starts to feel the importance of connecting with the community… the drive to belong to something greater than a busy schedule, the need to do more… time seems to slow down just a bit. and meeting at their local yarn shop, The Net Loft. In this remote, little village you’ll find one of the most beautiful shops in the all the land. Well, see it’s not really a yarn shop… it’s the general store, the mercantile, the haberdashery… there’s the most exquisite yarn with multiple collections themed off the colors from the surrounding area, jewelry, painting supplies, dishes, lotions, table linens, baby gifts… anything you might need for that special occasion. it has heart and soul. a collective group based on knitting… to participate, to be connected and to have a sense of belonging. You can read more about this specific painting by Nicola Slattery on Dotty’s blog. Pull up a chair, you’re in for a treat. Many of you might be wondering… why did I go to Cordova? Dotty creates the most amazing event called “Fiber and Friends.” It doesn’t happen every year so I would highly recommend if you are at all interested in attending any of Dotty’s events you subscribe to the shop’s newsletter. On a personal note, I met the most amazing people while attending this event… I’ve made friends for life whether they live in Cordova or were there for the week… Dotty, Coleen, Terri, Anna, Susan, Lori, Jane, and so many more. At a time when I was feeling rather isolated… I found my folk, my peacekin, right there in that geographically isolated little town with a huge heart. Thank you Dotty and The Net Loft. P.S. This post is one of the most cherished ones I've written yet... this place, the people, the message are so dear to me. There's something about 60 North that has captured my heart... Shetland and Cordova. It certainly can't be attributed to the weather... it's something about the magical aspect of the people and place. Of all my blog posts, this one has been the most challenging to write. The need to do justice to this place and the people has created some pressure… expectations. Many posts, I just write and let them go, they’ll be what they are… but this one was different… how can I capture all those emotions in one short space. Maybe when the times right, I’ll be able to explore in words more specifics on the week.